It was a sea of sapphire on the old courthouse steps in downtown Fairfield Saturday, April 13, when NorthBay Healthcare fielded its largest running team ever—332 participants— in the annual Run for Good event. More than $28,000 was raised to benefit the Matt Garcia Youth Center. 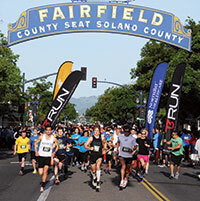 The event, now in its fifth year, features both a 5K and 10K, and added a children’s race this year.